Cigarettes-to-hotels conglomerate ITC, energy major Reliance Industries and lenders ICICI Bank and HDFC Bank were among the losers in the main index as investors locked in profits after the market had rallied 7.3% last week. Shares in retailers such as Pantaloon Retail, Shoppers Stop and Trent fell after the ruling Congress party appeared to have put on hold plans to open up the country’s $450 billion retail industry to foreign supermarkets. 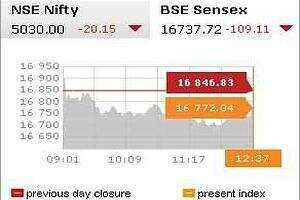 At 12:15pm, the main 30-share index was down 0.66% at 16,737.29 points, with 21 of its components trading in the red. The benchmark, which is one of the world’s worst performers this year having fallen 18%, could slide to 14,500 over the next six months because of disappointment in GDP and earnings growth, Bank of America Merrill Lynch said. Export-led software services exporters Infosys and Tata Consultancy Services were subdued even after a survey showed India’s services sector expanded in November for the first time in two months as new business accelerated. Angel Broking said in a note investors would be watching German services Purchasing Managers Index (PMI) due on Monday, as the country’s support remains crucial to tackling the euro zone debt crisis. Pantaloon Retail shares were down 9.3%, while Shopper’s Stop shed 3.3% and Trent, the retail arm of the Tata Group conglomerate, slid 2.6%. ITC was down 1.7%, Reliance Industries and ICICI Bank shed 1.1% each and HDFC Bank fell 1.5%. The 50-share NSE index was down 0.7% at 5,015.45 points. In the broader market, 711 losers were ahead of 627 gainers on total volume of about 236 million shares. The MSCI’s broadest index of Asia Pacific shares outside Japan was down 0.07%, while Japan’s Nikkei was up 0.6%. Bank of India rose 1.7% after the state-run firm said late on Saturday it would buy 51% of Indian asset manager Bharti Axa Investment Managers Pvt Ltd from the firm’s two joint venture partners. UltraTech Cement firmed 1.2% after the largest Indian cement producer said shipments in November rose an annual 16.3% to 3.09 million tonnes. Ashok Leyland rose 1% after the bus and truck maker said on Saturday its November vehicle sale climbed 53%.